At the last moment, I also added the 1921 Pilgrim ACG commemorative coin that failed to cross over to PCGS in November 2012. The reason, as we reported in this post? Questionable toning (arg!). ACG coins tone and this one has been in a holder most probably for a quarter century! I usually am very good at predicting PCGS crossover grades. This time, I was spot on in a few coins and off a point or two in others. I sent in a 1917 Green Label PCI half dollar, predicting AU50-55. I had concerns about the strike and luster. To my surprise, it crossed over: AU58. I searched for weeks for an undergraded MS65 ICG coin and found an 1880-S Morgan with full cheek and minimal bag marks. I predicted a crossover. It did: MS65. I predicted the 1962 PR69 Franklin Half would come in at PR66-67. 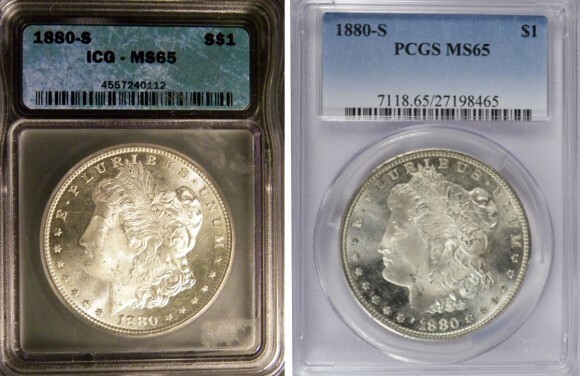 It registered PR68, not a bad crossover at all, considering I paid $23 for the coin now worth $65 in a PCGS holder. 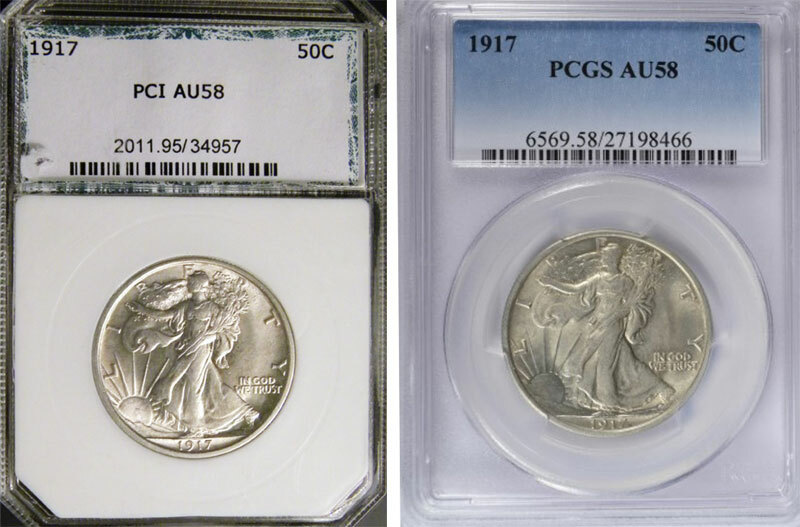 I predicted MS62 for a 1926-S Peace Dollar graded MS63 by ACG. I had concerns about a few bag marks. Bingo! It crossed over at MS63. 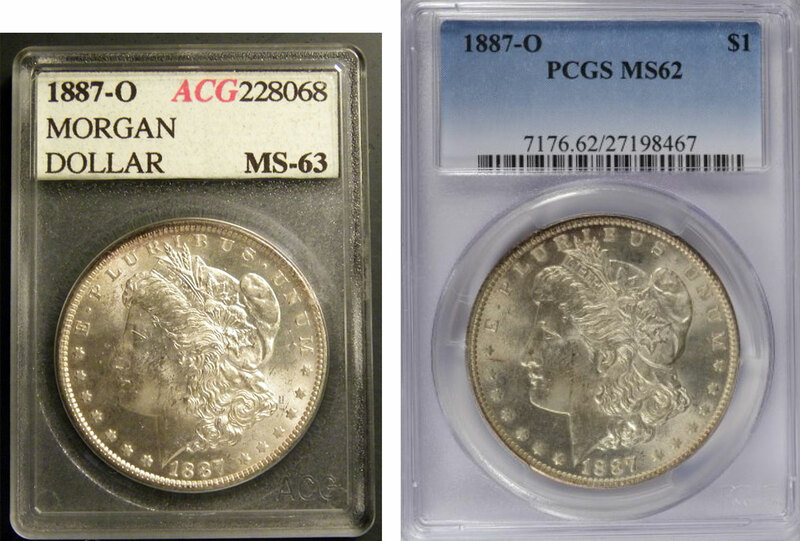 Again, a $30 difference between what I paid for the coin and how it is valued now in a PCGS holder. I predicted a crossover for an 1887-O MS63 ACG Morgan which, I thought, had sufficient luster and non-distracting bag marks. That coin crossed under at MS62. I know that some viewers reading this post may believe that exercises like this and other crossover posts indicate that I may like the holder more than the coin. That’s nonsense. What these exercises attempt to do (and inspire in you) is expertise in grading, the ability to see the same grade as world-class numismatists do within a point or so. Grading is subjective–to a point (pun intended). If one knows the standards–PCGS ones can be found compliments of Photograde Online–one can like the coin rather than the holder for numismatic reasons (luster, devices, tone, strike, etc.). Predicting grades in crossover submissions–and then comparing your grades to those of the experts–can be gratifying as one learns more about a holdering company’s standards. In turn, this helps when you decide whether to send in a raw coin for grading.